We are very excited to be co-chairing the quilt show again this year. Our show committee is already hard at work on a World of Quilts XXXIX. The raffle quilt designed by Donna Chambers is beautiful. In addition to the quilt we also have a Bernina sewing machine donated by Pins and Needles in Mount Kisco. Our speaker and invitational quilter is Victoria Findlay Wolfe. We look forward to hearing her lecture and viewing her amazing quilts. As all of our committee members organize all of the behind the scenes work it is time to ask you, all of our guild members, for your support. 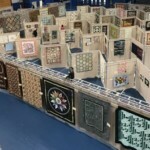 The most important part of any quilt show is…….the quilts! We hope you are working on a quilt (or 2) that you can put in our show. Whether you are a beginning quilter or a master quilter, art, modern or traditional quilter we look forward to displaying your work. Let’s show all of our visitors what our guild is all about. If you have had a quilt in the show before you know how thrilling it is to see your work admired. If you have never put a quilt in the show please consider putting one in this year. Let’s have all members proudly wearing an “exhibitor” ribbon. Also, now is the time to be thinking about donating a quilt for the Silent Auction. This is a part of our show that many visitors look forward to. Of course it takes many volunteer hours to put on a show of this size. Volunteer sign- ups begin in January and we ask all members to work 2 hours on the show starting with judging all the way through to take-down. Remember, it takes an entire guild to have a successful show!